Alhazen: the Father of Optics and the First Scientist – Is the West ready for Islam? With the decline of the Greco-Roman realm, scientific progress shifted to the Islamic world. In particular, al-Maʾmūn, the seventh ʿAbbāsid caliph of Baghdad, founded the House of Wisdom (Bayt al-Hikma) in ad 830 to translate, study, and improve upon Hellenistic works of science and philosophy. Among the initial scholars were al-Khwārizmī and al-Kindī. Known as the “philosopher of the Arabs,” al-Kindī extended the concept of rectilinearly propagating light rays and discussed the mechanism of vision. By 1000, the Pythagorean model of light had been abandoned, and a ray model, containing the basic conceptual elements of what is now known as geometrical optics, had emerged. In particular, Ibn al-Haytham (Latinized as Alhazen), in Kitab al-manazir (c. 1038; “Optics”), correctly attributed vision to the passive reception of light rays reflected from objects rather than an active emanation of light rays from the eyes. He also studied the mathematical properties of the reflection of light from spherical and parabolic mirrors and drew detailed pictures of the optical components of the human eye. Ibn al-Haytham’s work was translated into Latin in the 13th century and was a motivating influence on the Franciscan friar and natural philosopher Roger Bacon. Bacon studied the propagation of light through simple lenses and is credited as one of the first to have described the use of lenses to correct vision. Ajoy Chatak. Optics. Fourth Edition, McGraw-Hill Companies, 2009. Page 1.2. Abdus Salam, H. R. Dalafi, Mohamed Hassan. Renaissance of sciences in Islamic countries. 1994. Page 31. Also mentioned in the Second edition of Ideals and Realities. Rosanna Gorini (2003). “Al-Haytham the Man of Experience. First Steps in the Science of Vision”, International Society for the History of Islamic Medicine. Institute of Neurosciences, Laboratory of Psychobiology and Psychopharmacology, Rome, Italy. “light.” Encyclopædia Britannica. 2010. Encyclopædia Britannica Online. 13 Apr. 2010 <http://www.britannica.com/EBchecked/topic/340440/light>. Bradley Steffens. Ibn al-Haytham: First Scientist. Morgan Reynolds publishing, North Carolina, 2007. For the Moon crater, see Alhazen (crater) . For the asteroid, see 59239 Alhazen . Abū ʿAlī al-Ḥasan ibn al-Ḥasan ibn al-Haytham (Arabic: أبو علي، الحسن بن الحسن بن الهيثم, Persian: ابن هیثم, Latinized: Alhacen or (deprecated) Alhazen) (965 in Basra – c. 1040 in Cairo) was a Muslim, scientist and polymath described in various sources as either Arabic or Persian. He is frequently referred to as Ibn al-Haytham, and sometimes as al-Basri (Arabic: البصري), after his birthplace in the city of Basra. Alhazen made significant contributions to the principles of optics, as well as to physics, astronomy, mathematics, ophthalmology, philosophy, visual perception, and to the scientific method. He was also nicknamed Ptolemaeus Secundus (“Ptolemy the Second”) or simply “The Physicist” in medieval Europe. Alhazen wrote insightful commentaries on works by Aristotle, Ptolemy, and the Greek mathematician Euclid. Born circa 965, in Basra, present-day Iraq, he lived mainly in Cairo, Egypt, dying there at age 74. Over-confident about practical application of his mathematical knowledge, he assumed that he could regulate the floods of the Nile. After being ordered by Al-Hakim bi-Amr Allah, the sixth ruler of the Fatimid caliphate, to carry out this operation, he quickly perceived the impossibility of what he was attempting to do, and retired from engineering. Fearing for his life, he feigned madness and was placed under house arrest, during and after which he devoted himself to his scientific work until his death. Alhazen, the great Islamic polymath. Alhazen was born in Basra, in the Iraq province of the Buyid Empire . Many historians have different opinions about his ethnicity whether he was Arab or Persian . He probably died in Cairo, Egypt. During the Islamic Golden Age, Basra was a “key beginning of learning”, and he was educated there and in Baghdad, the capital of the Abbasid Caliphate, and the focus of the “high point of Islamic civilization”. During his time in Buyid Iran, he worked as a civil servant and read many theological and scientific books. One account of his career has him called to Egypt by Al-Hakim bi-Amr Allah, ruler of the Fatimid Caliphate, to regulate the flooding of the Nile, a task requiring an early attempt at building a dam at the present site of the Aswan Dam. After his field work made him aware of the impracticality of this scheme, and fearing the caliph’s anger, he feigned madness. He was kept under house arrest from 1011 until al-Hakim’s death in 1021. During this time, he wrote his influential Book of Optics. After his house arrest ended, he wrote scores of other treatises on physics, astronomy and mathematics. He later traveled to Islamic Spain. During this period, he had ample time for his scientific pursuits, which included optics, mathematics, physics, medicine, and the development of the modern experimental scientific method. Some biographers have claimed that Alhazen fled to Syria, ventured into Baghdad later in his life, or was in Basra when he pretended to be insane. In any case, he was in Egypt by 1038. During his time in Cairo, he became associated with Al-Azhar University, as well the city’s “House of Wisdom”, known as Dar al-`Ilm (House of Knowledge), which was a library “first in importance” to Baghdad’s House of Wisdom. Among his students were Sorkhab (Sohrab), a Persian student who was one of the greatest people of Iran‘s Semnan and was his student for over 3 years, and Abu al-Wafa Mubashir ibn Fatek, an Egyptian scientist who learned mathematics from Alhazan. Front page of a Latin edition of Alhazen’s Thesaurus opticus, showing how Archimedes set on fire the Roman ships before Syracuse with the help of parabolic mirrors. Alhazen made significant improvements in optics, physical science, and the scientific method. Alhazen’s work on optics is credited with contributing a new emphasis on experiment. His influence on physical sciences in general, and on optics in particular, has been held in high esteem and, in fact, ushered in a new era in optical research, both in theory and practice. The Latin translation of his main work, Kitab al-Manazir (Book of Optics), exerted a great influence on Western science: for example, on the work of Roger Bacon, who cites him by name, and on Johannes Kepler. His research in catoptrics (the study of optical systems using mirrors) centred on spherical and parabolic mirrors and spherical aberration. He made the observation that the ratio between the angle of incidence and refraction does not remain constant, and investigated the magnifying power of a lens. His work on catoptrics also contains the problem known as “Alhazen’s problem”. Meanwhile in the Islamic world, Alhazen’s work influenced Averroes‘ writings on optics, and his legacy was further advanced through the ‘reforming’ of his Optics by Persian scientist Kamal al-Din al-Farisi (d. ca. 1320) in the latter’s Kitab Tanqih al-Manazir (The Revision of [Ibn al-Haytham’s] Optics). 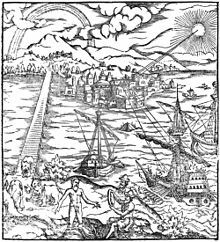 The correct explanations of the rainbow phenomenon given by al-Fārisī and Theodoric of Freiberg in the 14th century depended on Alhazen’s Book of Optics. The work of Alhazen and al-Fārisī was also further advanced in the Ottoman Empire by polymath Taqi al-Din in his Book of the Light of the Pupil of Vision and the Light of the Truth of the Sights (1574). He wrote as many as 200 books, although only 55 have survived, and many of those have not yet been translated from Arabic. Even some of his treatises on optics survived only through Latin translation. During the Middle Ages his books on cosmology were translated into Latin, Hebrew and other languages. The crater Alhazen on the Moon is named in his honour, as was the asteroid 59239 Alhazen. 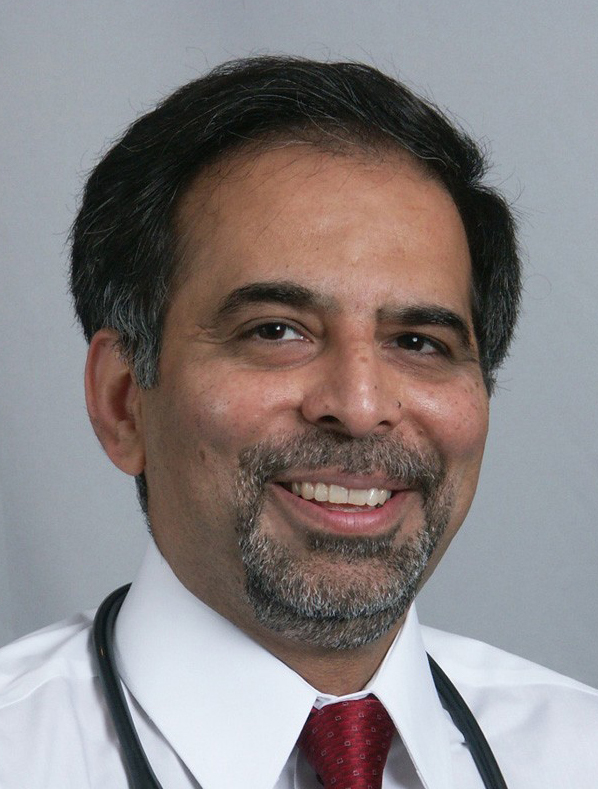 In honour of Alhazen, the Aga Khan University (Pakistan) named its Ophthalmology endowed chair as “The Ibn-e-Haitham Associate Professor and Chief of Ophthalmology”. Alhazen (by the name Ibn al-Haytham) is featured on the obverse of the Iraqi 10,000 dinars banknote issued in 2003, and on 10 dinar notes from 1982. A research facility that UN weapons inspectors suspected of conducting chemical and biological weapons research in Saddam Hussein’s Iraq was also named after him. Alhazen’s most famous work is his seven volume Arabic treatise on optics, Kitab al-Manazir (Book of Optics), written from 1011 to 1021. Optics was translated into Latin by an unknown scholar at the end of the 12th century or the beginning of the 13th century. It was printed by Friedrich Risner in 1572, with the title Opticae thesaurus: Alhazeni Arabis libri septem, nuncprimum editi; Eiusdem liber De Crepusculis et nubium ascensionibus. Risner is also the author of the name variant “Alhazen”; before Risner he was known in the west as Alhacen, which is the correct transcription of the Arabic name. This work enjoyed a great reputation during the Middle Ages. Works by Alhazen on geometric subjects were discovered in the Bibliothèque nationale in Paris in 1834 by E. A. Sedillot. Other manuscripts are preserved in the Bodleian Library at Oxford and in the library of Leiden. Two major theories on vision prevailed in classical antiquity. The first theory, the emission theory, was supported by such thinkers as Euclid and Ptolemy, who believed that sight worked by the eye emitting rays of light. The second theory, the intromission theory supported by Aristotle and his followers, had physical forms entering the eye from an object. Alhazen argued that the process of vision occurs neither by rays emitted from the eye, nor through physical forms entering it. He reasoned that a ray could not proceed from the eyes and reach the distant stars the instant after we open our eyes. He also appealed to common observations such as the eye being dazzled or even injured if we look at a very bright light. He instead developed a highly successful theory which explained the process of vision as rays of light proceeding to the eye from each point on an object, which he proved through the use of experimentation. His unification of geometrical optics with philosophical physics forms the basis of modern physical optics. Alhazen proved that rays of light travel in straight lines, and carried out various experiments with lenses, mirrors, refraction, and reflection. He was also the first to reduce reflected and refracted light rays into vertical and horizontal components, which was a fundamental development in geometric optics. He proposed a causal model for the refraction of light that could have been extended to yield a result similar to Snell’s law of sines, however Alhazen did not develop his model sufficiently to attain that result. Alhazen also gave the first clear description and correct analysis of the camera obscura and pinhole camera. While Aristotle, Theon of Alexandria, Al-Kindi (Alkindus) and Chinese philosopher Mozi had earlier described the effects of a single light passing through a pinhole, none of them suggested that what is being projected onto the screen is an image of everything on the other side of the aperture. Alhazen was the first to demonstrate this with his lamp experiment where several different light sources are arranged across a large area. He was thus the first to successfully project an entire image from outdoors onto a screen indoors with the camera obscura. In addition to physical optics, The Book of Optics also gave rise to the field of “physiological optics”. Alhazen discussed the topics of medicine, ophthalmology, anatomy and physiology, which included commentaries on Galenic works. He described the process of sight, the structure of the eye, image formation in the eye, and the visual system. He also described what became known as Hering’s law of equal innervation, vertical horopters, and binocular disparity, and improved on the theories of binocular vision, motion perception and horopters previously discussed by Aristotle, Euclid and Ptolemy. His most original anatomical contribution was his description of the functional anatomy of the eye as an optical system, or optical instrument. His experiments with the camera obscura provided sufficient empirical grounds for him to develop his theory of corresponding point projection of light from the surface of an object to form an image on a screen. It was his comparison between the eye and the camera obscura which brought about his synthesis of anatomy and optics, which forms the basis of physiological optics. As he conceptualized the essential principles of pinhole projection from his experiments with the pinhole camera, he considered image inversion to also occur in the eye, and viewed the pupil as being similar to an aperture. Regarding the process of image formation, he incorrectly agreed with Avicenna that the lens was the receptive organ of sight, but correctly hinted at the retina being involved in the process. 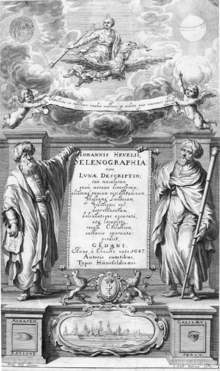 Hevelius’s Selenographia, showing Alhasen [sic] representing reason, and Galileo representing the senses. An aspect associated with Alhazen’s optical research is related to systemic and methodological reliance on experimentation (i’tibar) and controlled testing in his scientific inquiries. Moreover, his experimental directives rested on combining classical physics (‘ilm tabi’i) with mathematics (ta’alim; geometry in particular) in terms of devising the rudiments of what may be designated as a hypothetico-deductive procedure in scientific research. This mathematical-physical approach to experimental science supported most of his propositions in Kitab al-Manazir (The Optics; De aspectibus or Perspectivae) and grounded his theories of vision, light and colour, as well as his research in catoptrics and dioptrics (the study of the refraction of light). His legacy was further advanced through the ‘reforming’ of his Optics by Kamal al-Din al-Farisi (d. ca. 1320) in the latter’s Kitab Tanqih al-Manazir (The Revision of [Ibn al-Haytham’s] Optics). His work on catoptrics in Book V of the Book of Optics contains a discussion of what is now known as Alhazen’s problem, first formulated by Ptolemy in 150 AD. It comprises drawing lines from two points in the plane of a circle meeting at a point on the circumference and making equal angles with the normal at that point. This is equivalent to finding the point on the edge of a circular billiard table at which a cue ball at a given point must be aimed in order to carom off the edge of the table and hit another ball at a second given point. Thus, its main application in optics is to solve the problem, “Given a light source and a spherical mirror, find the point on the mirror where the light will be reflected to the eye of an observer.” This leads to an equation of the fourth degree. This eventually led Alhazen to derive the earliest formula for the sum of fourth powers; by using an early proof by mathematical induction, he developed a method that can be readily generalized to find the formula for the sum of any integral powers. He applied his result of sums on integral powers to find the volume of a paraboloid through integration. He was thus able to find the integrals for polynomials up to the fourth degree. Alhazen eventually solved the problem using conic sections and a geometric proof, though many after him attempted to find an algebraic solution to the problem, which was finally found in 1997 by the Oxford mathematician Peter M. Neumann.. Recently, Mitsubishi Electric Research Labs (MERL) researchers Amit Agrawal, Yuichi Taguchi and Srikumar Ramalingam solved the extension of Alhazen’s problem to general rotationally symmetric quadric mirrors including hyperbolic, parabolic and elliptical mirrors. They showed that the mirror reflection point can be computed by solving an eighth degree equation in the most general case. If the camera (eye) is placed on the axis of the mirror, the degree of the equation reduces to six. Alhazen’s problem can also be extended to multiple refractions from a spherical ball. Given a light source and a spherical ball of certain refractive index, the closest point on the spherical ball where the light is refracted to the eye of the observer can be obtained by solving a tenth degree equation. Chapters 15–16 of the Book of Optics covered astronomy. Alhazen was the first to discover that the celestial spheres do not consist of solid matter. He also discovered that the heavens are less dense than the air. These views were later repeated by Witelo and had a significant influence on the Copernican and Tychonic systems of astronomy. Sudanese psychologist Omar Khaleefa has argued that Alhazen should be considered be the “founder of experimental psychology“, for his pioneering work on the psychology of visual perception and optical illusions. In the Book of Optics, Alhazen was the first scientist to argue that vision occurs in the brain, rather than the eyes. He pointed out that personal experience has an effect on what people see and how they see, and that vision and perception are subjective. Khaleefa has also argued that Alhazen should also be considered the “founder of psychophysics“, a subdiscipline and precursor to modern psychology. Although Alhazen made many subjective reports regarding vision, there is no evidence that he used quantitative psychophysical techniques and the claim has been rebuffed. Alhazen offered an explanation of the Moon illusion, an illusion that played an important role in the scientific tradition of medieval Europe. Many authors repeated explanations that attempted to solve the problem of the Moon appearing larger near the horizon than it does when higher up in the sky, a debate that is still unresolved. Alhazen argued against Ptolemy’s refraction theory, and defined the problem in terms of perceived, rather than real, enlargement. He said that judging the distance of an object depends on there being an uninterrupted sequence of intervening bodies between the object and the observer. When the Moon is high in the sky there are no intervening objects, so the Moon appears close. The perceived size of an object of constant angular size varies with its perceived distance. Therefore, the Moon appears closer and smaller high in the sky, and further and larger on the horizon. Through works by Roger Bacon, John Pecham and Witelo based on Alhazen’s explanation, the Moon illusion gradually came to be accepted as a psychological phenomenon, with the refraction theory being rejected in the 17th century. Although Alhazen is often credited with the perceived distance explanation, he was not the first author to offer it. Cleomedes (c. 2nd century) gave this account (in addition to refraction), and he credited it to Posidonius (c. 135-50 BC) Ptolemy may also have offered this explanation in his Optics, but the text is obscure. Alhazen’s writings were more widely available in the middle ages than those of these earlier authors, and that probably explains why Alhazen received the credit. Some have suggested that Alhazen’s views on pain and sensation may have been influenced by Buddhist philosophy. He writes that every sensation is a form of ‘suffering‘ and that what people call pain is only an exaggerated perception; that there is no qualitative difference but only a quantitative difference between pain and ordinary sensation. Besides the Book of Optics, Alhazen wrote several other treatises on optics. His Risala fi l-Daw’ (Treatise on Light) is a supplement to his Kitab al-Manazir (Book of Optics). The text contained further investigations on the properties of luminance and its radiant dispersion through various transparent and translucent media. He also carried out further examinations into anatomy of the eye and illusions in visual perception. He built the first camera obscura and pinhole camera, and investigated the meteorology of the rainbow and the density of the atmosphere. Various celestial phenomena (including the eclipse, twilight, and moonlight) were also examined by him. He also made investigations into refraction, catoptrics, dioptrics, spherical mirrors, and magnifying lenses. In his treatise, Mizan al-Hikmah (Balance of Wisdom), Alhazen discussed the density of the atmosphere and related it to altitude. He also studied atmospheric refraction. He discovered that the twilight only ceases or begins when the Sun is 19° below the horizon and attempted to measure the height of the atmosphere on that basis. In astrophysics and the celestial mechanics field of physics, Alhazen, in his Epitome of Astronomy, discovered that the heavenly bodies “were accountable to the laws of physics“. Alhazen’s Mizan al-Hikmah (Balance of Wisdom) covered statics, astrophysics, and celestial mechanics. He discussed the theory of attraction between masses, and it seems that he was also aware of the magnitude of acceleration due to gravity at a distance. His Maqala fi’l-qarastun is a treatise on centres of gravity. Little is known about the work, except for what is known through the later works of al-Khazini in the 12th century. In this treatise, Alhazen formulated the theory that the heaviness of bodies varies with their distance from the centre of the Earth. formulated a clear conception of the relationship between an ideal mathematical model and the complex of observable phenomena; in particular, he was the first to make a systematic use of the method of varying the experimental conditions in a constant and uniform manner, in an experiment showing that the intensity of the light-spot formed by the projection of the moonlight through two small apertures onto a screen diminishes constantly as one of the apertures is gradually blocked up. In the dynamics and kinematics fields of mechanics, Alhazen’s Risala fi’l-makan (Treatise on Place) discussed theories on the motion of a body. He maintained that a body moves perpetually unless an external force stops it or changes its direction of motion. Alhazen’s concept of inertia was not verified by experimentation, however. Galileo Galilei repeated Alhazen’s principle, centuries later, but introduced the concept of frictional force and provided experimental results. In his Treatise on Place, Alhazen disagreed with Aristotle‘s view that nature abhors a void, and he thus used geometry to demonstrate that place (al-makan) is the imagined three-dimensional void between the inner surfaces of a containing body. Alhazen further criticized Ptolemy’s model on other empirical, observational and experimental grounds, such as Ptolemy’s use of conjectural undemonstrated theories in order to “save appearances” of certain phenomena, which Alhazen did not approve of due to his insistence on scientific demonstration. Unlike some later astronomers who criticized the Ptolemaic model on the grounds of being incompatible with Aristotelian natural philosophy, Alhazen was mainly concerned with empirical observation and the internal contradictions in Ptolemy’s works. While he attempted to discover the physical reality behind Ptolemy’s mathematical model, he developed the concept of a single orb (falak) for each component of Ptolemy’s planetary motions. This work was eventually translated into Hebrew and Latin in the 13th and 14th centuries and subsequently had an influence on astronomers such as Georg von Peuerbach during the European Middle Ages and Renaissance. Alhazen’s The Model of the Motions of Each of the Seven Planets, written in 1038, was a book on astronomy. The surviving manuscript of this work has only recently been discovered, with much of it still missing, hence the work has not yet been published in modern times. Following on from his Doubts on Ptolemy and The Resolution of Doubts, Alhazen described the first non-Ptolemaic model in The Model of the Motions. His reform was not concerned with cosmology, as he developed a systematic study of celestial kinematics that was completely geometric. This in turn led to innovative developments in infinitesimal geometry. His reformed empirical model was the first to reject the equant and eccentrics, separate natural philosophy from astronomy, free celestial kinematics from cosmology, and reduce physical entities to geometric entities. The model also propounded the Earth’s rotation about its axis, and the centres of motion were geometric points without any physical significance, like Johannes Kepler‘s model centuries later. In the text, Alhazen also describes an early version of Occam’s razor, where he employs only minimal hypotheses regarding the properties that characterize astronomical motions, as he attempts to eliminate from his planetary model the cosmological hypotheses that cannot be observed from the Earth. Alhazen distinguished astrology from astronomy, and he refuted the study of astrology, due to the methods used by astrologers being conjectural rather than empirical, and also due to the views of astrologers conflicting with that of orthodox Islam. Alhazen also wrote a treatise entitled On the Milky Way, in which he solved problems regarding the Milky Way galaxy and parallax. In antiquity, Aristotle believed the Milky Way to be caused by “the ignition of the fiery exhalation of some stars which were large, numerous and close together” and that the “ignition takes place in the upper part of the atmosphere, in the region of the world which is continuous with the heavenly motions.” Alhazen refuted this and “determined that because the Milky Way had no parallax, it was very remote from the earth and did not belong to the atmosphere.” He wrote that if the Milky Way was located around the Earth’s atmosphere, “one must find a difference in position relative to the fixed stars.” He described two methods to determine the Milky Way’s parallax: “either when one observes the Milky Way on two different occasions from the same spot of the earth; or when one looks at it simultaneously from two distant places from the surface of the earth.” He made the first attempt at observing and measuring the Milky Way’s parallax, and determined that since the Milky Way had no parallax, then it does not belong to the atmosphere. In 1858, Muhammad Wali ibn Muhammad Ja’far, in his Shigarf-nama, claimed that Alhazen wrote a treatise Maratib al-sama in which he conceived of a planetary model similar to the Tychonic system where the planets orbit the Sun which in turn orbits the Earth. However, the “verification of this claim seems to be impossible”, since the treatise is not listed among the known bibliography of Alhazen. In mathematics, Alhazen built on the mathematical works of Euclid and Thabit ibn Qurra. He systemized conic sections and number theory, carried out some early work on analytic geometry, and worked on “the beginnings of the link between algebra and geometry.” This in turn had an influence on the development of René Descartes‘s geometric analysis and Isaac Newton‘s calculus. In geometry, Alhazen developed analytical geometry and established a link between algebra and geometry. He discovered a formula for adding the first 100 natural numbers, using a geometric proof to prove the formula. Alhazen made the first attempt at proving the Euclidean parallel postulate, the fifth postulate in Euclid’s Elements, using a proof by contradiction, where he introduced the concept of motion and transformation into geometry. He formulated the Lambert quadrilateral, which Boris Abramovich Rozenfeld names the “Ibn al-Haytham–Lambert quadrilateral”, and his attempted proof also shows similarities to Playfair’s axiom. His theorems on quadrilaterals, including the Lambert quadrilateral, were the first theorems on elliptical geometry and hyperbolic geometry. These theorems, along with his alternative postulates, such as Playfair’s axiom, can be seen as marking the beginning of non-Euclidean geometry. His work had a considerable influence on its development among the later Persian geometers Omar Khayyám and Nasīr al-Dīn al-Tūsī, and the European geometers Witelo, Gersonides, Alfonso, John Wallis, Giovanni Girolamo Saccheri and Christopher Clavius. In elementary geometry, Alhazen attempted to solve the problem of squaring the circle using the area of lunes (crescent shapes), but later gave up on the impossible task. The two lunes formed from a right triangle by erecting a semicircle on each of the triangle’s sides, inward for the hypotenuse and outward for the other two sides, are known as the lunes of Alhazen; they have the same total area as the triangle itself. He also tackled other problems in elementary (Euclidean) and advanced (Apollonian and Archimedean) geometry, some of which he was the first to solve. His contributions to number theory includes his work on perfect numbers. In his Analysis and Synthesis, Alhazen was the first to realize that every even perfect number is of the form 2n−1(2n − 1) where 2n − 1 is prime, but he was not able to prove this result successfully (Euler later proved it in the 18th century). In psychology and musicology, Alhazen’s Treatise on the Influence of Melodies on the Souls of Animals was the earliest treatise dealing with the effects of music on animals. In the treatise, he demonstrates how a camel’s pace could be hastened or retarded with the use of music, and shows other examples of how music can affect animal behaviour and animal psychology, experimenting with horses, birds and reptiles. Through to the 19th century, a majority of scholars in the Western world continued to believe that music was a distinctly human phenomenon, but experiments since then have vindicated Alhazen’s view that music does indeed have an effect on animals. According to Al-Khazini, Alhazen also wrote a treatise providing a description on the construction of a water clock. In early Islamic philosophy, Alhazen’s Risala fi’l-makan (Treatise on Place) presents a critique of Aristotle‘s concept of place (topos). Aristotle’s Physics stated that the place of something is the two-dimensional boundary of the containing body that is at rest and is in contact with what it contains. Alhazen disagreed and demonstrated that place (al-makan) is the imagined three-dimensional void between the inner surfaces of the containing body. He showed that place was akin to space, foreshadowing René Descartes‘s concept of place in the Extensio in the 17th century. Following on from his Treatise on Place, Alhazen’s Qawl fi al-Makan (Discourse on Place) was a treatise which presents geometric demonstrations for his geometrization of place, in opposition to Aristotle’s philosophical concept of place, which Alhazen rejected on mathematical grounds. Abd-el-latif, a supporter of Aristotle’s philosophical view of place, later criticized the work in Fi al-Radd ‘ala Ibn al-Haytham fi al-makan (A refutation of Ibn al-Haytham’s place) for its geometrization of place. 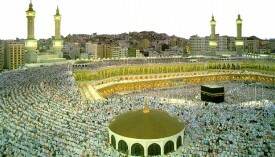 Alhazen was a devout Muslim, though it is uncertain which branch of Islam he followed. He may have been either a follower of the orthodox Ash’ari school of Sunni Islamic theology according to Ziauddin Sardar and Lawrence Bettany (and opposed to the views of the Mu’tazili school), a follower of the Mu’tazili school of Islamic theology according to Peter Edward Hodgson, or a follower of Shia Islam possibly according to A. I. Sabra. Alhazen wrote a work on Islamic theology, in which he discussed prophethood and developed a system of philosophical criteria to discern its false claimants in his time. He also wrote a treatise entitled Finding the Direction of Qibla by Calculation, in which he discussed finding the Qibla, where Salah prayers are directed towards, mathematically. Alhazen was a pioneer in many areas of science, making significant contributions in varying disciplines. His optical writings influenced many Western intellectuals such as Roger Bacon, John Pecham, Witelo, Johannes Kepler. His pioneering work on number theory, analytic geometry, and the link between algebra and geometry, also had an influence on René Descartes‘s geometric analysis and Isaac Newton‘s calculus. Understanding History by John Child, Paul Shuter, David Taylor – Page 70. ^ Science and Human Destiny by Norman F. Dessel, Richard B. Nehrich, Glenn I. Voran – Page 164. The Journal of Science, and Annals of Astronomy, Biology, Geology by James Samuelson, William Crookes – Page 497. ^ . doi:10.1068/p5940. PMID 18546671. ^ Smith, A. Mark (1992). “Review of A. I. Sabra, The Optics of Ibn al-Haytham. Books I, II, III: On Direct Vision“. The British Journal for the History of Science (Cambridge University Press) 25 (3): 358–9. JSTOR 4027260. ^ Ross, H.E. and Plug, C. (2002) The mystery of the moon illusion: Exploring size perception. Oxford: Oxford University Press. ^ Ross, H.E. (2000) Cleomedes (c. 1st century AD) on the celestial illusion, atmospheric enlargement and size-distance invariance. Perception, 29: 853-861. ^ Ross,H.E. and Ross, G.M. (1976) Did Ptolemy understand the moon illusion? Perception, 5: 377-385. ^ Some writers, however, argue that Alhazen’s critique constituted a form of heliocentricity (see (Qadir 1989, pp. 5–6 & 10)). In seventeenth century Europe the problems formulated by Ibn al-Haytham (965–1041) became known as ‘Alhazen’s problem’. […] Al-Haytham’s contributions to geometry and number theory went well beyond the Archimedean tradition. Al-Haytham also worked on analytical geometry and the beginnings of the link between algebra and geometry. Subsequently, this work led in pure mathematics to the harmonious fusion of algebra and geometry that was epitomised by Descartes in geometric analysis and by Newton in the calculus. Al-Haytham was a scientist who made major contributions to the fields of mathematics, physics and astronomy during the latter half of the tenth century. In effect, this method characterized parallel lines as lines always equidisant from one another and also introduced the concept of motion into geometry. Three scientists, Ibn al-Haytham, Khayyam and al-Tusi, had made the most considerable contribution to this branch of geometry whose importance came to be completely recognized only in the nineteenth century. In essence their propositions concerning the properties of quadrangles which they considered assuming that some of the angles of these figures were acute of obtuse, embodied the first few theorems of the hyperbolic and the elliptic geometries. Their other proposals showed that various geometric statements were equivalent to the Euclidean postulate V. It is extremely important that these scholars established the mutual connection between this postulate and the sum of the angles of a triangle and a quadrangle. By their works on the theory of parallel lines Arab mathematicians directly influenced the relevant investigations of their European counterparts. The first European attempt to prove the postulate on parallel lines – made by Witelo, the Polish scientists of the thirteenth century, while revising Alhazen’s Book of Optics (Kitab al-Manazir) – was undoubtedly prompted by Arabic sources. The proofs put forward in the fourteenth century by the Jewish scholar Gersonides, who lived in southern France, and by the above-mentioned Alfonso from Spain directly border on Ibn Alhazen’s demonstration. Above, we have demonstrated that Pseudo-Tusi’s Exposition of Euclid had stimulated borth J. Wallis’s and G. Saccheri’s studies of the theory of parallel lines. ^ Alsina, Claudi; Nelsen, Roger B. (2010), “9.1 Squarable lunes”, Charming Proofs: A Journey into Elegant Mathematics, Dolciani mathematical expositions, 42, Mathematical Association of America, pp. 137–144, ISBN 9780883853481. Hockney, David (2006), Secret Knowledge: Rediscovering the Lost Techniques of the Old Masters, ISBN 0-14-200512-6 (New and Expanded Edition). 328 pages. index. list of illustrations. bibliography. ‘textual evidence’ section cites Alhazen 240, 242, 277, 279, 284. Entire book records Hockney’s investigation of the camera obscura and his rediscovery of its use in portraiture. Sabra, A. I. (1971), “The astronomical origin of Ibn al-Haytham’s concept of experiment”, Actes du XIIe congrès international d’histoire des sciences (Albert Blanchard, Paris) 3: 133–136. Reprinted in Sabra, A. I. (1994), Optics, Astronomy and Logic: Studies in Arabic Science and Philosophy, Collected Studies Series, 444, Variorum, Aldershot, ISBN 0-86078-435-5, OCLC 30739740 29847104 30739740. Sabra, A. I. (2008) [1970–80]. “Ibn Al-Haytham, Abū ʿAlī Al-Ḥasan Ibn Al-Ḥasan“. Complete Dictionary of Scientific Biography. Encyclopedia.com. Online Galleries, History of Science Collections, University of Oklahoma Libraries High resolution images of works by Alhazen in .jpg and .tiff format. Ibn al-Haytham.” Encyclopædia Britannica. 2010. Encyclopædia Britannica Online. 13 Apr. 2010 . At the beginning of Kitab al-Manazir, or The Book of Optics, the medieval scholar Ibn al-Haytham expresses skepticism about the ability of human beings to understand the complex workings of nature. “When inquiry concerns subtle matters, perplexity grows, views diverge, opinions vary, conclusions differ, and certainty becomes difficult to obtain,” he wrote. One of the problems with discovering the truth about nature, Ibn al- Haytham realized, is that human beings have physical limitations that can affect their observations. “The premises are gleaned from the senses,” he wrote, “and the senses, which are our tools, are not immune from error.”Haunted by doubts about human perception and rea¬son, Ibn al-Haytham searched for new ways to establish the validity of observations, theories, and conclusions.Knowing that mathematical equations and geometric proofs did not vary from person to person, he used mathematics to describe natural phenomena whenever possible. He also devised simple, repeatable experiments to test hypotheses and support conclusions. By systematically applying these methods of inquiry to his research, Ibn al-Haytham helped to launch a new era in the history of learning-the age of modern science. Alhazen: the Father of Optics and the First Scientist – For Christians, To be Born Again in Islam! linked to this post. site regularly, if so agter that you will absolutely take fastidious experience.